Much like some of the reviews themselves, our Critical Consensus on Kingdom Hearts III has been somewhat delayed - to the point where we already know the game is off to a great start. From selling more than 600,000 copies in its first week at home in Japan to breaking series records and topping the charts for the first time in the UK, Square Enix's Final Fantasy/Disney mash-up has shown plenty of gamers never tired of their fourteen-year wait for a full sequel. With the majority of critics having released their thoughts on this odd odyssey, after waiting for Square Enix's scattered review code distribution, Kingdom Hearts III seems to have been worth that wait, scoring a Metacritic rating of 80 on Xbox One and 86 on PlayStation 4. In her 4.5/5 review for USGamer, Caty McCarthy praises the game's old-school stylings, describing it as "the most sterling example of an oft-ignored era of JRPGs: the PlayStation 2 generation." She goes on to say that it "feels like a relic" (in a good way), resulting in "a PS2 game with better combat design, more to do, and best of all, its PS2-styled character models looking incredible in HD." "It reveals the power that games have to ape what's on the screen, to render near-perfectly the lines and curves of Pixar's artists"
However, she does note that some of the series' tried-and-tested structure feels a little out-of-place when considered alongside more moden releases. "At first, Donald and Goofy calling things out as we walked around was endearing, but after the hundredth time Donald quacked, 'This could be a good spot to find some ingredients', I wanted to smack him upside the head with my keyblade," she writes. "Combat may be more lively and fun, but overall the game was still quite easy on Normal mode -- I only died once my entire 30 hours with the main story, and that's with exploring and taking my time... The cutscenes, too, are very, very frequent in what feels a tad outdated, pacing-wise." Nevertheless, there's plenty to like in Kingdom Hearts III. Key to its appeals are the various Disney-themed worlds on offer, with this entry shying away from visiting Final Fantasy realms as often as previous games did. In his 4/10 review for VideoGamer.com -- one of the rare negative critiques we found out there -- Josh Wise praised "the shifting art styles as I entered each new world." "It reveals the power that games have to ape what's on the screen, to render near-perfectly the lines and curves of Pixar's artists," he writes. "It has a curiously clinical feel, once the initial buzz has worn off. In fact, the most beautiful of the worlds, to my eye, wasn't Pixar at all; it was 100 Acre Wood. Seeing the yellowy shades of E.H. Shepard, faded like foxed paper, was more evocative than any other." McCarthy says the worlds themselves are "where the PS2 heritage feels the most apparent", but that they far exceed anything the previous outings accomplished: "The environments are bigger than ever before, and mostly gone are the tedious loading screens; though long cutscenes remain sliced in between. There are also fewer worlds than most past entries, and instead the focus seems to be narrowed on widening the scope of each world." This time around each world has a bunch of side quests for players to indulge in, although critics agree these tend to be a mixed bag. While the Pirates of the Caribbean section has an entire archipelago to explore -- described by many as a miniature Assassin's Creed: Black Flag -- some have more trivial distractions, like the Hundred Acre Wood's vegetable-themed match three puzzle game. As Kimberley Wallace notes in her 9.5 review for Game Informer, "not every world is a winner." "I wasn't a big fan of Tangled and its repetitive forests and silly dancing minigame," she says. "I also hated when I was forced to go on silly little fetch quests, like collecting 300 crabs for Jack Sparrow, or searching for all of Olaf's hidden body parts in Frozen. "The expanded size and scope of the worlds in Kingdom Hearts III makes this the best and most varied collection of destinations in the franchise"
"But even with those frustrations, the expanded size and scope of the worlds in Kingdom Hearts III makes this the best and most varied collection of destinations in the franchise. Even the graphics are impressive for how close they mimic the films, right down to Pixar's clear and exaggerated style to the live-action realism of the Pirates of the Caribbean." There was also plenty of praise for the combat. While it's acknowledged the battles aren't particularly challenging -- opinions vary as to whether this is a good thing -- none deny how polished the series' combat has become. "It's all about looking great and fighting with style; not just finishing off enemies, but doing so without taking a hit," Chris Schilling says in his unrated Eurogamer review. "That's easier said than done at times with a wayward camera and a lock-on that doesn't always do its job. Dream Drop Distance's Flowmotion feature, which lets you swing around poles and trees and chain moves together, doesn't work nearly as well here as in the compact environments on 3DS. "Nevertheless, throughout it all, Sora feels thrillingly agile. By the end, he's running up walls, diving off to launch into mid-air combos, his keyblade shifting into a giant hammer or a pair of honey-shooting guns, before joining Donald to release a cascade of fireworks to finish off a group of Heartless. When it flows, it's spectacular stuff." Wise, however, disagrees: "Combat is a hack and slash affair. Well, it's hack, anyway; the slash is unaccounted for. Beating enemies senseless is achieved, chiefly, with just the one button, and after 30-something hours, I'm concerned for the health of the X button on my PlayStation 4 controller. There is some variety, but only if you seek it out. There are spells and summons that deputise a number of characters to your cause - riding an adult Simba into battle, say, or a spot of synchronised swimming with Ariel, lending fresh meaning to the phrase 'splash damage'." Wallace also found minor grumbles with the game. In addition to the aforementioned mini-games, she bemoans the "repetitive boss battles toward the end, since repeatedly facing similar foes is a tedious way to drag out the finale". She was also disappointed that, aside from a few fun references, the presence of Final Fantasy in this mash-up has "been reduced to a very minor role", adding: "The lessening of Final Fantasy cameos didn't impact my enjoyment, but the characters don't play a role in the main story." The main criticism shared across all reviews, high and low scoring alike, was the narrative barrier to entry for Kingdom Hearts III. While seemingly the conclusion of a trilogy, there are roughly ten other games that need to be taken into account, all spread over multiple platforms and the best part of two decades. 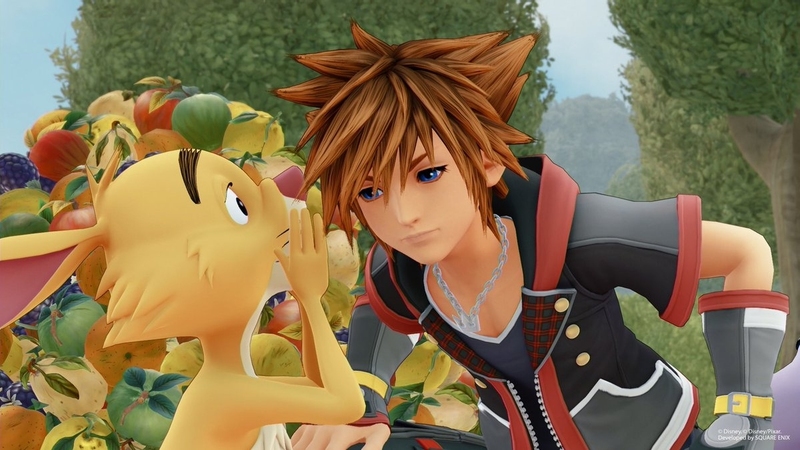 "If you're a Kingdom Hearts obsessive, it's hard to imagine you won't be satisfied with how fully it wraps things up, and those invested in the characters may find themselves dabbing away a tear or five"
McCarthy assures that "Kingdom Hearts III knows how to both hold the hands of players not familiar with the past 17 years of the series, as well as respect the knowledge of diehards", but Schilling disagrees, arguing a game that "should really have a spring in its step -- this is Disney, for goodness' sake -- [is] constantly burdened by its own knotty history." "Those who know what's what will be bored by the endless exposition, and those who don't won't have the faintest clue what's going on in some scenes," he writes. "It says much that half the time the cast seem equally baffled. 'I'm confused,' says Toy Story's Woody after one plot point is explained for a second time. Later, in a moment of sheer exasperation, Monsters Inc's Mike Wazowski says what most of us are thinking: 'I have no idea who or what you're talking about!'" Wise also notes that while scenes and lines are lifted wholesale from the films that inspired them, the fact they are shoehorned into another narrative -- and one that's been developing for years -- means they lose something in the transition. "The wryness of writers like Brad Bird, Joss Whedon, and Andrew Stanton is absent, and the game narrative is focussed squarely on the youth of its audience, with its eyes looking downward," he says. "Only, they needn't be. The young yearn for complexity and can sense when all is pat and potted for them. Kingdom Hearts III is overflowing with heart, and mostly unconcerned with the head; as such, it's in dire want of wickedness." Of course, it's unreasonable to expect newcomers to appreciate a finale (or what's certainly been built up as a major resolution point in the series) on the same level as series veterans. Critics who have stuck with the series from the beginning say they are not disappointed, and even Schilling recognises this as a powerful conclusion to Kingdom Hearts thus far. "It's a grand finale that feels both grand and, yes, final," he writes. "If you're a Kingdom Hearts obsessive, it's hard to imagine you won't be satisfied with how fully it wraps things up, and those invested in the characters may find themselves dabbing away a tear or five." Wallace agrees: "The new installment addresses threads that have been left hanging for years, and it does so by leveraging the Disney magic that seems to make anything possible. The result is the series at its strongest, and most importantly, it provides satisfying answers to the biggest question marks." 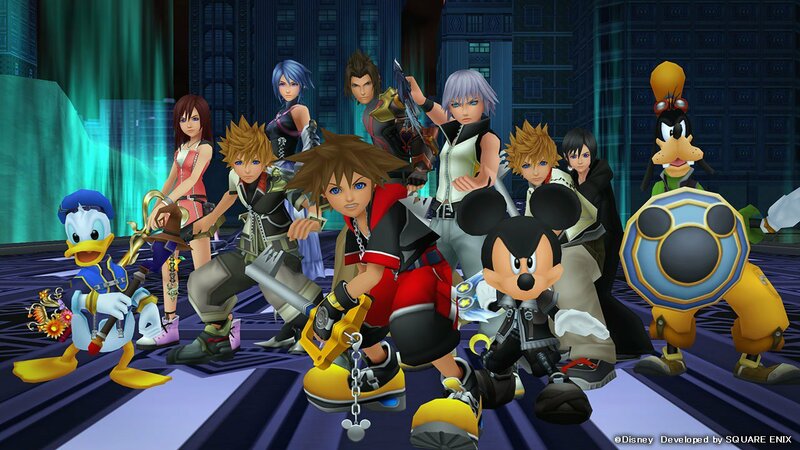 She concludes: "While not perfect, Kingdom Hearts III is the game I've been waiting for. After finishing it, I was delighted by how satisfied I was with the journey. I traversed worlds with some of my favorite Disney characters, persevered through challenging boss battles, and saw a triumphant finale that only makes me more excited for the future. The series still has a lot of heart, and that's what makes it so endearing."